My name is Abid Shah from Indian-occupied Kashmir. 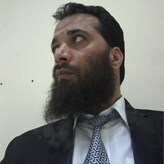 Alhamdullilah Working As an Assistant Director Sales in Riyadh KSA. I am a Nature loving Person and soft spoken. I love reading Islamic Litretare by Salafs. I would prefer marriage, according to Shariah of Rasoolullah (صلی اللہ علیہ وسلم) In Sha Allah. Wish to Achieve Martyrdom and wish to see Rasoolullah (صلی اللہ علیہ وسلم) by my naked yes.